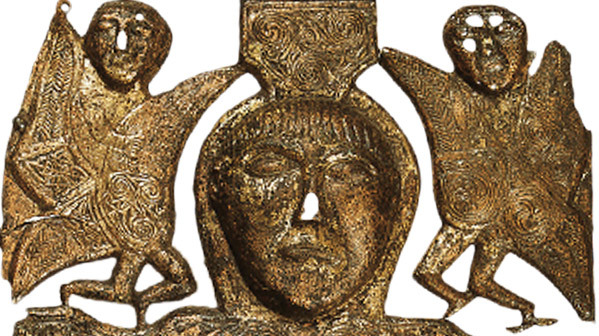 At first glance, this plaque, made from a thin sheet of copper-alloy and originally attached to some kind of wooden or metal backing, could be from anywhere in early mediaeval Europe. It is Christ on the cross. An angel hovers on each side of his head; on the left side is the Roman soldier who offered Jesus a sponge soaked in vinegar; on the right is the soldier who stabbed his side with a lance. This iconography had been used in Europe for about 200 years before this piece was made in Ireland. The plaque, found in St John’s churchyard on the shores of Lough Ree, in Rinnagan, Co. Roscommon, and originally a much shinier, more gilded object than it is now, is intriguing in two ways. First, what looks to us like a standard image is actually very rare in the Ireland of this time. The most striking aspect of Irish art of this period is that it displays relatively little interest in showing the human form or using images to tell stories. It is not that Irish artists could not deal with human figures they did so on high crosses—they simply chose not to do it very often. They, and presumably their patrons, were more interested in the fantastical filigrees and mind-bending patterns at which they excelled to a degree unsurpassed in Europe. The Rinnagan Crucifixion is thus, says Raghnall Ó Floinn of the National Museum, ‘the only narrative scene of such an early date that we have. There are fragments of other objects that may have been similar, but they are very much in the minority’. Apart from its rarity, the other startling thing about this Crucifixion is how utterly Irish it is. The basic image may be standard across Christendom, but the way it is treated is distinctive. If you look at it at all closely, what emerges is not just an object of Christian worship, but an eloquent statement of the way the Irish made their own synthesis of Christianity and an older culture. Christ’s mask-like face is full frontal, with an implacable stare that is oddly familiar from the pre-Christian Corleck Head, perhaps 600 years earlier. Jesus is not dead here: his eyes are open, and the image is meant to be triumphant. Even more fascinating is the pattern on Christ’s chest. It looks nothing like the standard image of the Crucifixion. Rather, it is made to look like a breastplate, with three back-toback C-shaped scrolls. There are similar patterns of triple spirals above the head of Christ and on the wings of the angels—a triple triad. This is typical Irish imagery, again going back to the Iron Age, and beyond. Even Jesus, it seems, is more than a little bit Irish.